Start speaking French, learn new vocabulary for your travels and explore the secret spots of Paris with this short story. Improve your listening skills with a free audio book, read to you by a charming native speaker. Immerse yourself in a new language as you follow the adventures of a young American woman Elza on her first trip to France. 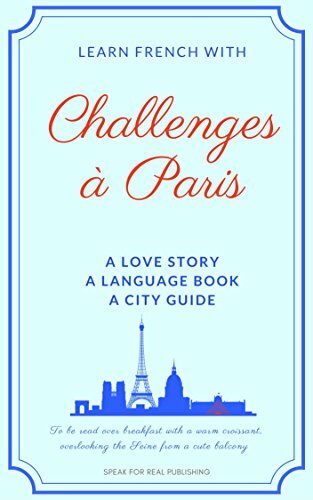 This book is based on an innovative and unique system that will get you talking despite all your fears, while socialising and discovering French culture. The 33 short chapters (no longer than 2 pages), are tailored to beginner and pre-intermediate level learners. You will be immersed in very useful dialogues for traveling situations, packed with the most common vocabulary and colloquial phrases. This book will help you get the skills and the confidence you need to head-start your French journey. - The story: short chapters follow a young American girl Elza on her first trip to Paris. Eager to learn and curious about the city, she will face many adventures and make encounters that will change her life forever. No spoilers! - The vocabulary: written by a French language specialist and professor with over 7 years of experience, this book will teach you new words and expressions seamlessly and effortlessly. And there is a recap at the end of each chapter to check your memory, too! - The audio: a recorded version of the book, read to you by a native speaker (and professional voice artist) will allow you master your accent, quickly check the pronunciation of a new word and just take a break from reading, while still learning! - The universality: it can be used by self-learners, in private or group classes, in language centers or in online schools. It is suitable for total beginners, who have never taken taken French before (as the story has been fully translated for you), as well as for those whose skills need a little pick-me-up. - The bonus: the book is packed with hidden gems of Paris: bakeries, perfume shops, bookshops, museums and restaurants. Discover secret spots and tips from a local, as you flick through the pages, following Elza’s adventures. This book will change your French learning experience. Read it, listen to it, travel within it and with it - and before you know it, you’ll be able to order your first croissant with a perfect French accent.